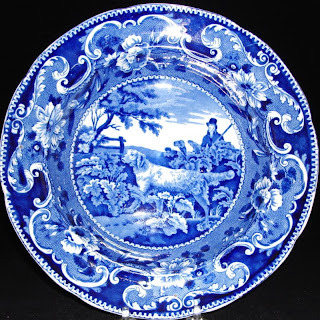 The dog on the Enoch Wood & Sons 10 inch soup plate looks like my sister's golden retriever, Sierra. 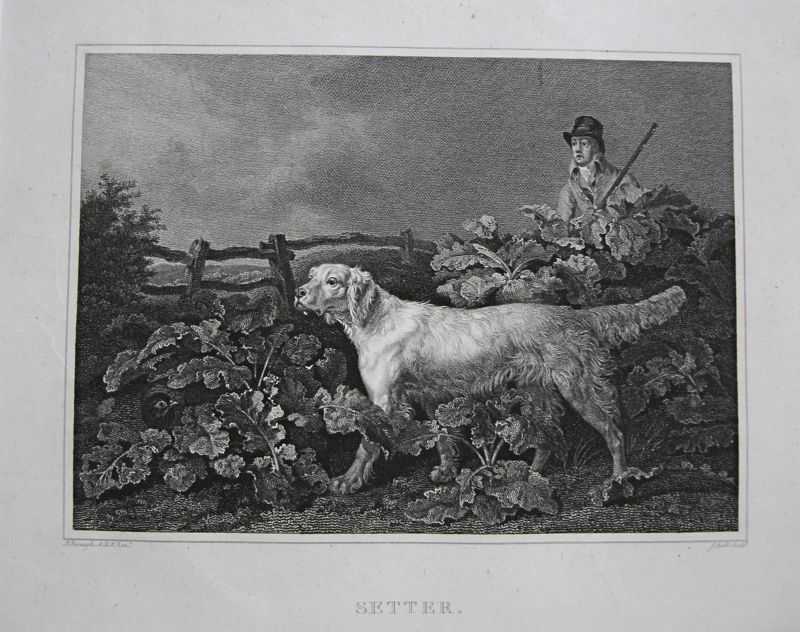 When I researched the pattern, I found that it was copied from a source print from William Taplin's 1803 book, "A Sportsman's Cabinet: A Correct Delineation of the Various dogs Used in the Sports of the Field, Including the Canine Race in General, consisting of a series of engravings of every distinct breed, from original paintings taken from life." (This is probably one of the longest titles I have ever seen!) The engravings were done by John Scott (1744-1827) after the paintings of the artist Philip Reinagle (1749-1833). I was surprised to see that the golden retriever engraving was actually titled "Setter." Or, to put it another way, what I thought was a golden retriever on my soup plate was actually a setter. The golden retriever is more than his looks. He was developed because the early 19th century improvement of guns resulted in more birds being downed and at greater distances than before. There was a need for a more powerful retriever with a soft mouth who was also gentle and trainable. 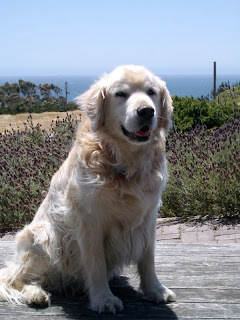 The seeds of golden retriever development were germinated in Scotland by Sir Dudley Marjoribanks, whose breeding records from 1835 to 1890 were published in 1952. The original cross was between a retriever and a Tweed water spaniel. In 1868 an Irish setter was added to the breeding program, along with a few other dogs. The ancestor of the golden retriever probably dates from the 1868 breeding results. However, golden retrievers were not accepted as a breed by The Kennel Club of England until 1903 and by the American Kennel Club until 1925. I have written a lot of words to show that the dog on the soup plate looks like a golden retriever, but is not one. 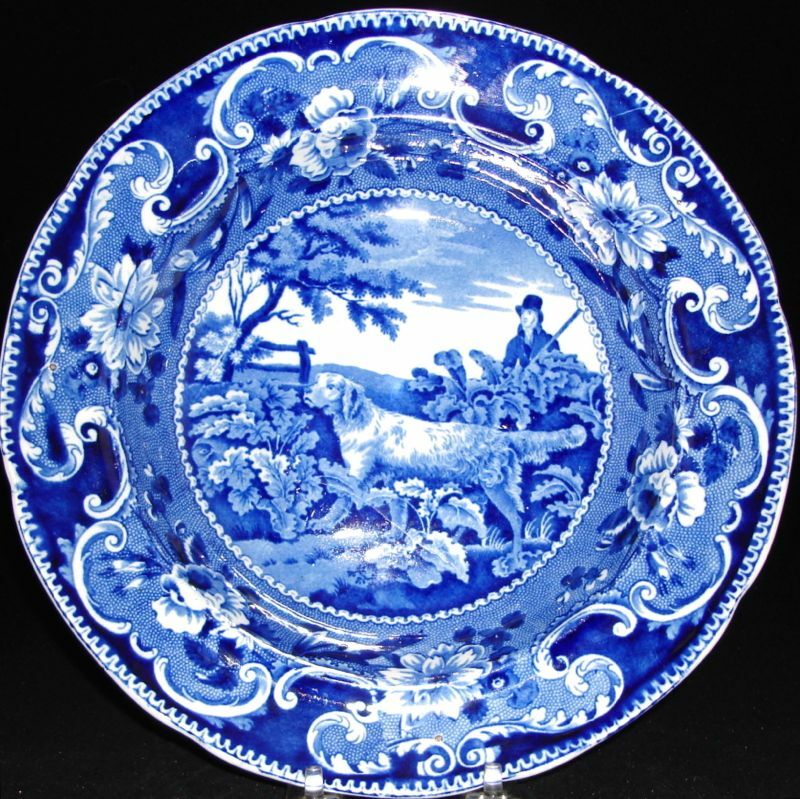 It appears that the lovely animal that we know as a golden retriever didn't exist in the 1820s, when this soup plate was made. I think you can see that Sierra resembles his British ancestor, even if it was a setter. If the border looks familiar, you may remember it surrounds the leopard in my "First Time" post (January 13, 2013). The setter discussed in this post, and the leopard, are both from Enoch Wood's Sporting Series. So far, thirty-two center patterns have been found in this series. WHEN IS A SAUCER A CUP?